“Let us pray for all men and women of good will to be instruments of harmony and the always-shining light of Christ in our neighborhoods, workplaces, schools and public places,” the bishop said in a statement Sept. 22. The protests late Sept. 20 and Sept. 21, with the crowds swelling at one point to 1,000 people, followed the fatal police shooting of 43-year-old Keith Lamont Scott, an African-American, outside an apartment complex the afternoon of Sept. 20. Charlotte-Mecklenburg police said while they were trying to serve a warrant on another person in the area, Scott approached them from his parked car carrying a handgun and ignoring their calls to drop it. In their statement, police said Officer Brentley Vinson, who also is an African-American, perceived an “imminent deadly threat” and shot Scott. Scott later died at a local hospital. Family members insisted that Scott was unarmed and was reading a book while waiting in the parking lot to pick up his son from a nearly school bus stop. Police said they recovered a weapon from the scene, not a book. Vinson has been placed on administrative leave while police conduct an investigation that includes eyewitness interviews and review of police video footage. When Scott family members took to social media to criticize police the evening of Sept. 20, people began to gather at the site of the shooting. By 11 p.m., the protest had swelled to about 1,000 people. When some protesters began throwing rocks and smashing the windows of several police cars, police used tear gas to disperse the crowd, but people continued to protest and block two roadways and, at one point, a nearby segment of Interstate 85, until early morning Sept. 21. Police arrested one person. More than a dozen police officers were slightly injured in the melee. Local television video also showed a few people looting and burning the cargo of a semi-truck that had stopped on the Interstate. 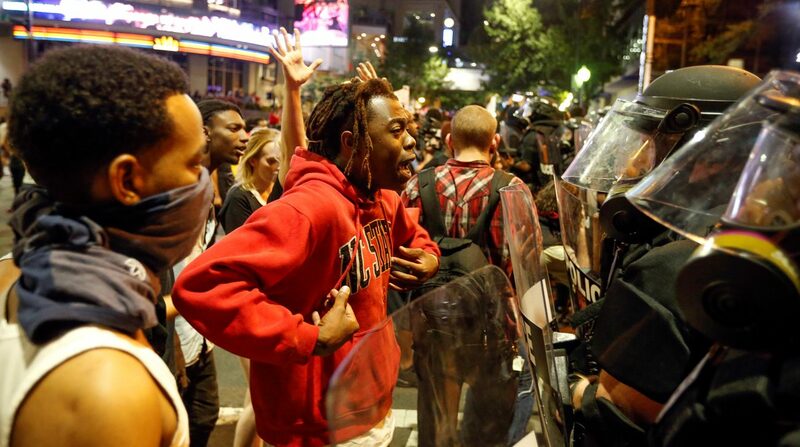 Protests turned violent for a second night Sept. 21 in uptown Charlotte, about 10 miles away from the site of the fatal police shooting, with several people injured and several businesses vandalized and looted. One person was reportedly shot and critically injured by another civilian. He was listed as being on life support at a local hospital. Charlotte-Mecklenburg police again used tear gas to try to clear the crowd, some of whom tried to block a section of Interstate 277 as they departed the protest area. “My heart bleeds for what is going on right now,” said Gov. Pat McCrory, who declared a state of emergency late that night after a request from Charlotte-Mecklenburg Police Chief Kerr Putney. The emergency notice triggered the North Carolina National Guard and the State Highway Patrol to assist local law enforcement in responding to the violence. “Let’s pray for our city and let’s pray for peace,” added McCrory, who was Charlotte’s mayor from 1995 to 2009. At a news conference Sept. 22, Putney said he would allow the family to view the footage, but it would not be released to the public. At St. Thomas Aquinas Catholic Church, just a few blocks from the scene of the police shooting and the protests there, about 150 people gathered Sept. 21 to pray for peace. During the evening eucharistic adoration and benediction, Father Patrick Winslow, pastor, offered prayers for police and for people who have suffered injustice, as well as prayers for his neighborhood and the city of Charlotte. History makes it clear, the priest said, that the light that vanquishes the darkness is not on the battlefield between nations or races, or “in the streets of Charlotte or any U.S. city.” “The true battlefield is within the human heart — within each of us,” he said. Guilfoyle is editor of the Catholic News Herald, newspaper of the Diocese of Charlotte.